Today is Disability Awareness Day! KSPC Claremont is centering dialogue around disability activism, the politics of disability, and those intersections with community building on and off campus through our programming on air today, April 3rd. Tune in for podcasts, interviews, and messages highlighting the critical work for disability awareness, all throughout our daytime programming. 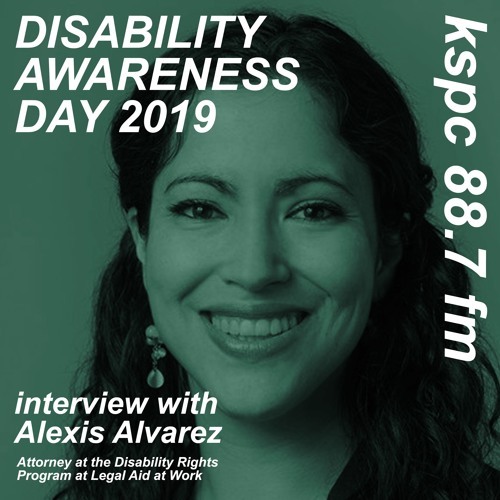 We are excited to air an interview with Alexis Alvarez today, who is a staff attorney at Legal Aid at Work on the Disability Rights Program. She will be talking about her work representing people with disabilities facing discrimination in employment and unequal access to government programs and services, especially for low-wage workers of color. She will also talk about how the current administration threatens disability rights through the privatization of healthcare.